I am so happy that Nell Pratt has asked me to introduce myself and my wonderful museum. 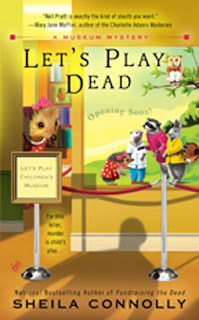 I’m Arabella Heffernan, the president of Let’s Play Museum in Philadelphia, and I love my job. Do you think that museums are dusty old places with boring paintings on the walls and endless hallways with hard stone floors? Guess what—Let’s Play is the exact opposite. It’s a museum for children, and we want children to have fun here. That means playing with the exhibits, and sometimes even climbing on them. All of our exhibits are kid-sized, low to the ground, and indestructible. We have a funky old building that used to be a factory, right in the center of Philadelphia. It’s kind of shabby, and you can see all the old pipes and such, but kids don’t care, and there’s nothing they can do to hurt it. We have a great gift shop, and you know what? There’s not a single thing there that runs on batteries. Maybe I’m old-fashioned, but I think “play” means more than pushing buttons on an electronic thingy. We’re very excited to be opening a new exhibit soon, based on the beloved children’s book series about Harriet the Hedgehog. Harriet is a real sweetie, and she has a lot of friends. She has a little trouble with Willie the Weasel, but he’s not all bad. The author of the books, Hadley Eastman, lives in the Philadelphia area, and we’re happy to have been able to work closely with her to put this all together. Of course, she’s just a teensy bit demanding, but Harriet is her baby in a way (she never had children of her own, poor dear) and I can see why she wants only the best for her. Besides, she’s a writer, and I’ve always heard they can be difficult. I was thrilled when I found out that Nell was going to be president of the Pennsylvania Antiquarian Society, because that means I can get to know her better. Sometimes the people who manage our wonderful local museums can be a bit stuffy, even though they mean well, but nobody would call Nell stuffy. And I hope they don’t think that I am! There are times when I feel like a big kid myself, and I love to leave my office and go downstairs just to watch the children enjoying our space. I was so pleased when my daughter Caitlin came to work here with me, and she’s done a wonderful job. I can’t wait until the new exhibit opens! I’m always afraid something will go wrong, but everything has gone well so far. Well, except for a few little tiffs with Hadley, but we worked things out. I hope you’ll all come! I'll be there! Can't wait. I can't wait to visit your museum. What a fabulous place. I remember going to a museum geared to children when I was a kid. Can't wait to visit yours! What a terrific place for kids. I'm looking forward to visiting it, too! Happy playing! !